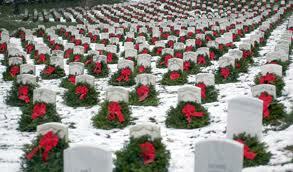 Through Wreaths Across America, veteran memorials and gravesites, including Arlington National Cemetery in Washington, D.C., are adorned with remembrance wreaths. The solemn tributes honor many of the 25 million men and women who have served in the U.S. armed forces and guarded and preserved America’s freedom throughout history. There is no way to calculate total civilian losses in war-torn regions.